EasyClean, Alternative to LST radiators - DiscreteHeat Co. Ltd. 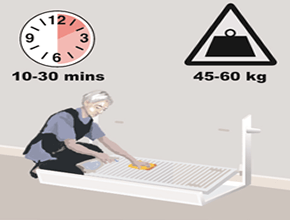 Infection Control and Health & Safety are two major concerns in the Health & Care Service; ThermaSkirt addresses these 2 main concerns far better than the current norm of LST radiators. 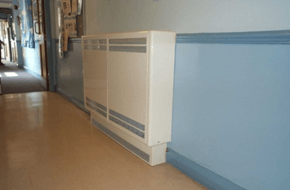 Until recently, LST (low surface temperature) radiators have been widely used in Healthcare, as they provide a simple heating system and are a well understood technology. With the recent drive to eradicate HAI’s (healthcare acquired infections) they have now been de-selected on any new NHS projects, as they are practically impossible to keep clean. It has been found that the convection currents they create draw in the microbiological infections from the floors, and into the radiator covers where they may hibernate in the dust and detritus already inside. At some point, when the radiators are turned on it can be shown that these same infections such as C.Difficile and MRSA are then expelled in the warm air from the radiators, and carried around the heated space, leading to their spread. With the recent rise in the awareness of so called ‘Superbugs’ such as MRSA and E.coli, C.Diff & MRSA, the problem of Healthcare Acquired Infection (HAI) has never been more acute. The risk of bacteria cross-contamination and contracting an infection is particularly high in the healthcare sector, where there are a large number of people with reduced immunity levels, in close proximity and an abundance of bacteria and infections. Obvious ways of passing on infection are direct contact with contaminated surfaces or via proximity and/or airborne communication. 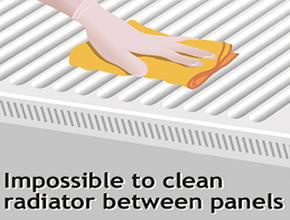 The Association of Healthcare Cleaning Professionals (AHCP), recommend that radiators & covers should be thoroughly cleaned and disinfected at least once a week, which led to the development of LST radiator covers that drop down and radiators that hinged in order to effect a deep clean. Practically though, this was impossible to achieve, as an average city hospital has around 800 radiators and the weight and size of the covers and water-filled radiators meant that only a well-trained army of physically fit cleaners could ever hope to meet that target. According to RoSPA, there are on average of 29,000 accidents involving radiators every year (source: HaSS & LaSS Statistics, 2001/2). Of these, more than 90% are impact injuries resulting from trips or falls onto them. 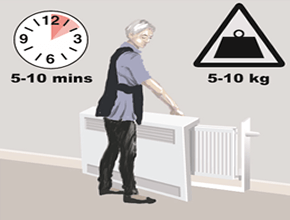 Despite the assertion that radiator covers make them ‘safer’ they in fact do far less to address the major cause of injury which is the young or old falling onto them. Despite the laudable adoption of rounded edges and concealed controls, the fact is that they still represent a 6”~ 8” protrusion of a hard surface that will cause significant injury if fallen onto. Unwary or uncontrollable patients could still collide into the side of them if moving at speed, causing serious injury, and of course they still provide an obstruction for trolleys and gurneys to negotiate. In 2005, more than 1500 persons committed suicide by hanging or self strangulation. As in most of these cases, death is caused without the victim being suspended, the risk of a ligature fixing must be removed. There should be no exposed pipes or valves that can enable the person in the care of the hospital or state to fix a ligature (a twisted bedsheet or item of clothing) to and take their own life. In the case of LST radiators, there are a number of potential ligature points that need protecting by lockable covers or fixed with security screws. This inevitably requires cleaning staff to be issued with the appropriate keys and/or release tools. Not with standing the logistical issues of the distribution of these keys & tools, there is also the risk of the theft or misappropriation of said keys and their misuse, and the probability of more than 1 key code/type being required to prevent this. The man hours required to maintain & control the issue of these keys cannot be underestimated. 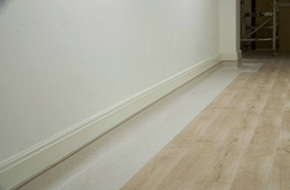 ThermaSkirt® has been independently tested by BSRIA to be at least 13% more efficient than a standard radiator system. This is because the heat is distributed around the entire perimeter of the room, and the larger surface area creates an even all round thermal environment. This more efficient heat distribution means that it can be run at lower temperatures, saving fuel costs and overall running cost of the heating system. If a boiler is turned down by 1.25°C it can reduce its carbon emissions by 5%, and with CO2 footprint reduction a key improvement target throughout most NHS Trusts ThermaSkirt® provides a significant step forward, as it can run with a flow temperature of 45&dge;C and maintain a mean room temperature of 21°C. 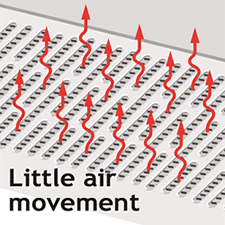 Radiators create convection currents, and rely on these convection currents to circulate the warm air around the room. The speed of the convection currents is directly proportional to the temperature of the radiator and the flow rate of air passing across it. This means that when the temperature is lower, then air flow & convection speed is lower. This does not allow enough momentum energy at low temperatures & air flow rates to carry the warmed air across the room. So the Low Surface Temperature Oversized Radiators, although overcoming the risk of scalding, seriously compromises the ability to heat a room. The covers ensure that flow temperatures have to be increased to 80°C+ to compensate.